If your kids are afraid of the dentist, then they are not alone so isn't time to make your child's next dental appointment enjoyable and fearless? Now a visit to the dentist can be pain free and worry free with the Children's Dental Place. In Dr. Michelle Handel-Herman of the Children's Dental Place was voted the Best Dentist of Boca from the West Boca Times.Dr. Michelle Handel-Herman is a general dentist who is limited to pediatric dentistry, practices in Boca Raton Florida and is a graduate of Temple University School of Dentistry in Philadelphia PA.Dr. Michelle Handel-Herman has extensive training and experience in treating children of all ages and she treats everything from routine check-ups and fillings to soft tissue surgeries. Dr. Handel-Herman has been practicing dentistry for many years and enjoys going to work every day and tells everyone "It is not work for me, since I enjoy what I do." Dr. Handel-Herman has extensive experience treating children with handicaps and disabilities. Dr. Handel-Herman is a loving mom of four boys and loves to care for children. She lives in Boca Raton in Palm Beach County and participates in many organizations. Dr. Handel-Herman says "I enjoy the balance between my career and my home life." Dr. Joe Herman who is also a general dentist who is limited to pediatric dentistry is a graduate of Case Western Reserve University School of Dentistry. He too has many hours of continuing education and has spent the last 16 years of his career treating patients of all ages. Dr. Herman comes from a family of dentists. His father and two brothers, all practice in south Florida as well. Three years ago, he joined the practice with his wife and has been treating children as well. "I love practicing dentistry with children. It is a very enjoyable and rewarding experience." 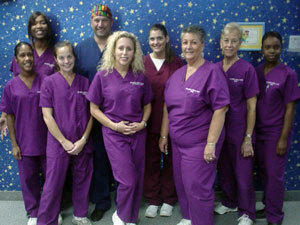 Together Dr. Handel-Herman and Dr. Joe Herman run the Children's Dental Place of Boca Raton. There, the two doctors enjoy treating children with the newest technologies. Drs Handel and Herman both use a Dental Laser called the Biolase Waterlase MD Laser to treat teeth. This advanced dental tool allows them to remove cavities without the need for needles, drills or discomfort. They also perform many soft tissues procedures, such as tongue tie releases and frenectomies. "When we first bought the laser we were very skeptical. But, after 5 years of working with the machine, we feel it is the best instrument in our practice. Children leave the office with smiles on their faces and are not upset about returning to the office for further treatment." The Children's Dental Place has an outer space theme throughout the office and treatment areas and is very child friendly. The staff is well trained and all enjoy working with children of all ages. Kids get to enjoy the game room when waiting for the dentist and there are flat screen TVs all around the office with the cartoon network playing to keep children occupied.The Children's Dental Place of Boca Raton FL located in the Mission Bay Plaza on the corner of 441 and Glades Road. The Children's Dental Place accepts most insurances and credit cards are welcomed. Call today for an appointment and let their family treat your family!!! 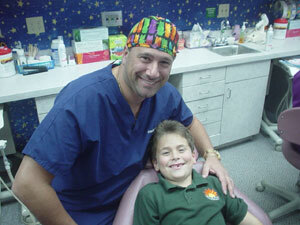 Dr. Handel-Herman voted the Best Dentist of Boca. Dr. Joe Herman with a happy patient after a checkup. 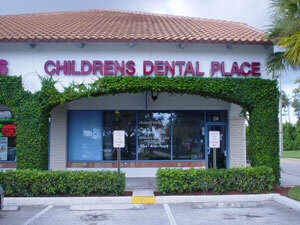 The Children's Dental Place in Boca Raton Florida. The childrens Dentists Dr Handel and Dr Joe Herman. 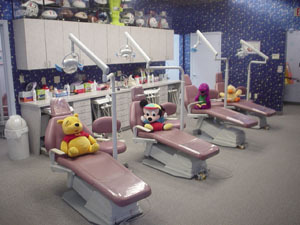 Children's Dental Place comfortable treatment area. The friendly staff of the Dentist office love kids.